Gendun Choephel (1903-1951) is a legendary figure in Tibet, not simply because he was believed to be the reincarnation of a famous Buddhist lama but also because this promising young monk eventually turned his back on monastic life and became a fierce critic of his country's religious conservatism, cultural isolationism and reactionary government. After leaving the monastery in 1934, and fueled by his intellectual curiosity and free-spirited nature, Choephel began extensive travels throughout Tibet and India in order to understand the true political history of his country. 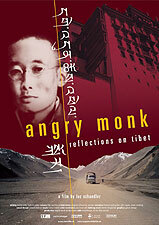 ANGRY MONK provides both a personal and political portrait of this pioneering and visionary intellectual who was also a smoking, drinking and sexually active man who renounced the "false duty of monastic obligations." The film traces the biography and historic times of Choephel, who lived between the British colonial invasion of 1903 and the occupation by the Chinese army in 1951. In addition to rare archival footage, Choephel's paintings and sketches, and contemporary scenes of many of the sites he visited, the documentary features interviews with Tibetan historians, scholars, writers, poets, a travel companion, a contemporaneous British diplomat, and Choephel's wife. Their commentary and reminiscences chronicle the major phases of Choephel's life, including his monastery education in Lhasa (1927-34), his journey across Tibet (1934-1938), his journey throughout India (1938-1946), and his return to Tibet (1946-1951). Choephel's many writings include a guide book to Buddhist holy sites in India, a Tibetan translation of the Kama Sutra, and a political history of Tibet published posthumously. He also wrote articles for an expatriate newspaper that criticized Tibet as a political, cultural and scientific backwater, which in 1946 led the Tibetan government to imprison Choephel for three years as a political subversive. Today Choephel is a revered figure in his Chinese-occupied homeland, and an influential symbol of hope for those seeking political and spiritual reform in a free Tibet. The Knowledge of Healing: The first feature documentary dealing extensively with Tibetan medicine.